The French government has been working on a six millions € project named ADEN (Appui au Désenclavement Numérique) to provide about 60 Public Internet Access Points in 13 African countries. These Access Points work on Open Source Software. Each center had six computers running on Linux, one server running also on Linux, one printer and a V-Sat connexion for the Internet. We set up 16 ADEN centers in Burkina in the cities of Kongoussi, Ouahigouya, Orodara, Dano, Tansila, Diapaga, Gaoua, Sebba, Nouna, Pô, Gorom-Gorom, Koupela, Nongana, Toma, Séguénéga and Kambissiri. Being involved in the ADEN project was a great experience. 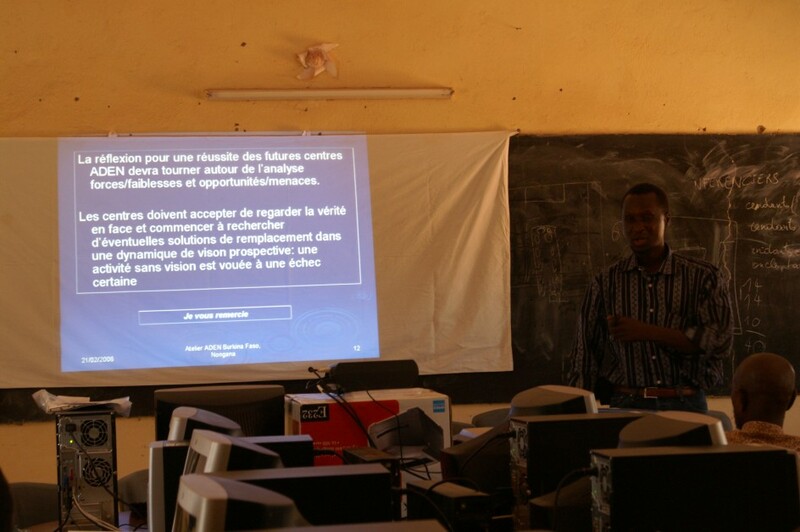 Indeed, I was in charge of bringing the first Internet connections to rural Burkina and it was a very challenging job. I was working with motivated people in the field, at the French Embassy and in the Burkinabé Government. Local communities played a crucial role for success of this project as they were willing to be more open to the world. Indeed, the ADEN project created jobs, brought knowledge to wide range of people, gave the opportunity to some of them to follow eLearning courses and brought digital services in remote areas.